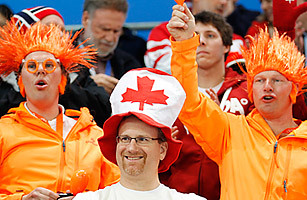 Fans of the Dutch and Canadian speed skaters react during the 5,000 meters race at the Richmond Olympic Oval at the Vancouver 2010 Olympics in Vancouver, British Columbia, Saturday, Feb. 13, 2010. They approach the starting line, two at a time, before an official with a French accent asks them if they're "re-dee?" The gun goes off, and they skate quietly around a 400-meter oval, swaying side-to-side, one hand on resting on their lower back. There's one lap, two laps; a little over a dozen laps during this 5,000-meter event, round and round for more than six minutes. They race against the times of the 26 other skaters in the competition, not their neighbor on the ice. As spectator sports go, long-track speed skating ranks somewhere between watching a stroll in the park and white noise. Yet, lining the stands of the Richmond Olympic Oval south of Vancouver on Saturday were more than a thousand people dressed in orange (the color of the Dutch royal family), singing, ringing cowbells, waving noisemakers, treating this somniferous sport as it were a championship title bout. When Dutchman Sven Kramer, 24, won the gold and set an Olympic 5,000-meter record, they roared. But, then again, they cheered boisterously for every skater that passed by them. As sports fans go, no group is more bewildering than the speed-skating nuts from Holland. With their face paint and unruly orange wigs, these people seem not to realize there's no real reason to get all excited about watching people skate in circles. Of course, you could say the same about NASCAR, but at least the cars jostle against each other for prime position, and there's a finish line in sight. Plus, when a car whizzes by you at 200 m.p.h., there's an adrenaline rush. As for humans gliding by you at 35 m.p.h. on skates, they don't even register a breeze. When you ask Dutch fans to explain why they get so psyched for this sport, they often leave you feeling even less enthused about it. "I like counting the laps," says Jeanine Renden, who along with her husband was wearing an orange wig with two lions perched at the top (like on the Dutch coat of arms). "It's exciting." Not nearly as exciting as her hairdo. If counting isn't your thing, you can always stare at the scoreboard. "It's every exciting to compare the times," says Dutch fan Eric Vanserstraadan, who was sporting two Dutch flags, one painted on each cheek. Speak to enough good people from the Netherlands, however, and you begin to appreciate their love of the sport. Ice-skating began more than 1,000 years ago, on the frozen canals and waterways of Scandinavia and Holland. By the 1600s, speed skating became a useful form of transportation for the Dutch, who used their blades to travel between villages. The Netherlands doesn't get much snow, and there are no mountains, so skiing is out of the question. But it gets cold, and the county's frozen winter waterways offer ample opportunities for outdoor skating. "In Holland, kids learn to walk and skate at the same time," says Pierre Hogers, drummer for a Dutch marching band called Kleintje Pils, which travels to speed skating events around the world to fire up the crowd (kleintje pils means "a little beer," because when the Dutch get together to watch speed skating, there's bound to be a little beer). More than a quarter of the country sits below sea level, so flood control is a major priority. Thus, when canals freeze over, Dutch fans explain that skating on them is cathartic. We have conquered our enemy. Let's celebrate by running our blades all over it! Skating is so ingrained in Dutch DNA that fans talk about one particular race, the "Eleven-City Tour," with the sort of reverence normally shown by global soccer fans for their favorite teams. The Eleven-City Tour is a 125-mile skate over frozen lakes and canals in the northern Dutch province of Friesland. Since all the water has to be frozen at once, the race is hardly an annual event. In fact, conditions haven't permitted an Eleven City Tour since 1997; the Dutch fans clearly long for another one. On a piece of paper Doekle Terpstra, head of the speed skating governing body in Holland, draws a likeness of the medal that participants receive when they finish the race. It looks like a tiny leaf. "I finished it in 1979 and 1985," he boasts. "I am very, very proud of those two medals." While other viewers of long-track speed skating may see monotony, the Dutch see rhythm, tension and athletic grace. "Boring?" asks Diederik Peereboom, a Dutch native who works as a consultant in Brussels, who was desperately looking for a ticket to the 5,000-meter event. "Well, we think your football is boring. They stand around for three hours for what, 15 minutes of action?" It also helps the Dutch spirits that their skaters bring home the hardware. Kramer won the 5,000-meter race on Saturday with a time of 6 min. 14.60 sec., setting a new Olympic record and nabbing his first gold. (American Chad Hedrick, the defending Olympic champion in this event, finished 11th; Shani Davis, the favorite in the middle-distance races, came in 12th.) Holland has now won 25 speed-skating golds in its Olympic history, tied for second with Norway behind the United States, which has 28, as the country with the most titles in the sport. Kramer is also the favorite in the 10,000 meters. Think watching 12 laps is torture? Have fun seeing 24. The Dutch will, of course. After Kramer's victory, Kleintje Pils played "We Will Rock You," "We Are the Champions" and several Dutch anthems as well. "Sven-e won a gold medal! Sven-e won a gold medal" the crowd sang. For the thousands of Dutch speed-skating fans who made the trip to Vancouver to liven up a pretty staid event, forget about Kleintje Pils. After Kramer's win, tonight's a night for Grote Pils. Big Beer. The Heinekens will be flowing in Vancouver. See pictures from the opening ceremonies. Watch a video on how the U.S. women's hockey team in heels.